1. 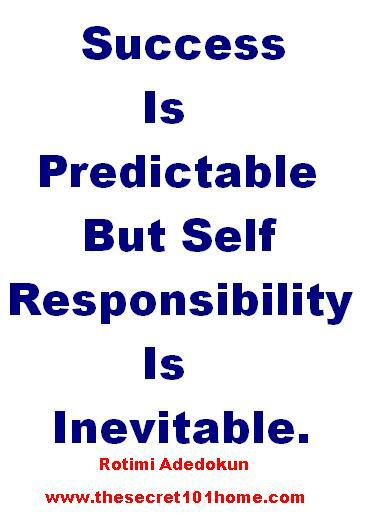 Success Is Predictable But Self Responsibility Is Inevitable. Success Is Inside Out. To Be Successful On The Outside You Have To Be Successful On The Inside. The Reason Is Simple: What Happen Inside You Will Determine What Happen Outside You. 2. Success Is Not Magic, So Greatness Is Not Error. If Truly You Are Successful You Will Have Capability To Duplicate And Repeat It At Anytime. The Reason Is Simple, Real Success Has Multiplier Effect. 3. Success Is Not For The Lazy, As Greatness Belongs To The Hard Workers. If You Give All That It Takes You Will Get All That You Need. Success Is For All But Not All Will Be Successful. If YOu Can Separate Hardwork From Success, I Will Show You The Souce Of Real Shame. 4. Success Have A Price Tag. Good Success Only Follow Those That Are Ready And Willing To Pay. Your Entitlement Is A Function Of Your Payment. Nothing Belongs To You Unless You Pay For The Real Worth. It Is Worth That You Place On Something That Makes You Not To Watch It Go Worst. 5. Success Is A Product Of Something From Nothing. Action Plus Faith Are The Two Ingredients Of Success. If You Don’t Procrastinate And Don’t Doubt, Life Give You Almost All Thing. As Doubt Steals, So Procrastination Distract. To Get What You Want, You Have To Be Ready To Give What You Have. This entry was posted in Creation and Wisdom, Life and Time Management, Self Development, The Secret, Vitamin Of The Mind and tagged BIshop David On Success, How to be successful, Jim Rohn on Success, Joshua 1:8, Pastor E A Adeboye On Success, Rotimi Adedokun On Success, Success 101, You Sall Have Good Success., You Should Meditate In It Day And Night. Bookmark the permalink.